Disaster. Crisis. Once oil-rich nation. This is the go-to rhetoric of the government of Canada, and now also, of the CBC which is nothing but a mouthpiece of the government when it comes to their so-called reporting about the country of Venezuela. The problem with this is that the CBC isn’t the government of Canada. They are, in fact, publicly- funded journalism that is supposed to operate based on its Mission and Principles; empty statements such as, “We are independent of all lobbies and all political and economic influence” or “Balance – On issues of controversy, we ensure that divergent views are reflected respectfully, taking into account their relevance to the debate and how widely held these views are” and “Impartiality – We provide professional judgment based on facts and expertise. We do not promote any particular point of view on matters of public debate.” Independence, balance, impartiality, when it comes to Venezuela, the CBC is anything but. The objective of the government of the United States and their imperialist allies, including Canada, is to overthrow the government of President Nicolas Maduro and reverse the gains of the Bolivarian Revolutionary process. It is now also, the objective of the CBC? For the CBC’s The Current, these basic principles of journalism have most certainly been thrown out the window, in favour of the far more sensationalist, bombastic, pro-intervention journalism – yellow journalism by definition (“the type of journalism that relies on sensationalism and lurid exaggeration to attract readers”). Yellow journalism supported the U.S./Canada/NATO invasion and occupation of Afghanistan, the U.S./UK invasion and occupation of Iraq, the countless other devasting wars, occupations and invasions carried out by the United States and their allies, including Canada. Today, yellow journalism is fueling and fomenting ever-increasing sanctions and threats against Venezuela. 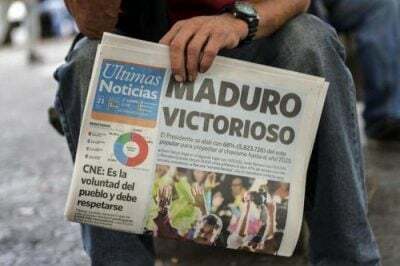 In merely a 20-minute report, Tremonti, together with the on-the-ground observations of another CBC senior correspondent Adrienne Arsenault, manages to spew-forth nearly every pro-intervention exaggerated claim about Venezuela there is to be found. Rather than share the perspectives of a leader of Venezuela’s government or one of the mass majority of people in Venezuela that support the democratically elected government of President Maduro, The Current instead chose to play a quote from the war-mongering United States Ambassador to the United Nations, Nikki Haley. This certainly sounds like the CBC is drumming for war and invasion against Venezuela (on behalf of the US). When Haley says “dealt with” there is no question that she means the U.S. President Donald Trump’s “all options are on the table when it comes to Venezuela” kind of dealt with; the kind of “dealt with” that means bloodshed in Venezuela. Anna Maria Tremonti continues her unprincipled and uncritical acceptance of every hawkish, pro-intervention statement about Venezuela as she interviews Adrienne Arsenault, who is reporting from the town of Cúcuta, Colombia. Arsenault paints a dramatic picture of the border town, carefully crafted to scream “humanitarian crisis” – an often repeated lie about Venezuela today. If the government of Venezuela doesn’t have access to cash, or the world banking and financial system, exactly how can they import the necessities that the people of Venezuela need? Also missing from the CBC’s report is any reference to the economic sabotage being carried out by Venezuela’s counter-revolutionary opposition. The majority of the production and distribution of food and basic goods in Venezuela is still in the hands of the ultra-rich. Among other acts of violence and terrorism, the reactionary capitalist class has carried out hoarding, price-gouging and even gone so far as to light food on fire to impose chaos and hunger on the people of Venezuela. By leaving sanctions, smuggling and economic sabotage out of the equation, The Current and Anna Maria Tremonti’s yellow journalism have left the listeners with only one conclusion, the government of Venezuela is to blame – and government of President Nicolas Maduro and the Bolivarian revolutionary process must be overthrown if the people of Venezuela are to get any relief. First of all, Venezuela is not Syria. Following seven years of U.S. attacks on Syria – bombing, intervention, and support for terrorist organizations, – 6.5 million people in Syria are food insecure, and 4 million are at risk of food insecurity (UN-FAO). More than half of the population of Syria, 12 million people, have been displaced, with more than 5.6 million people externally displaced. The highest estimate for the number of people that have left Venezuela between 2013-2017 – between 1.5-2.3 million people – isn’t even close to these devastating numbers. However, this statistic, from the UN Refugee Agency (UNHCR) cannot and should not be taken at face value because it doesn’t consider the nationality of the people that have left Venezuela. In a report published by the Colombian Office of the International Organization for Migration (IOM) in July, 2017, it was found that at the end of 2016, 67% of the people crossing into the three most effected Colombian border cities: Cúcuta, Villa del Rosario and Arauca, were either Colombian or Colombian-Venezuelans. Also, unlike Syrian refugees, who have no idea of when they will be able to return to Syria, according to the IOM report, more than 92% of people crossing intended to return to Venezuela within two months. In this segment, Tremonti doesn’t come close to recognizing that 5.6 million Colombians fled to Venezuela over the last decades (where was the “international outcry” about this? ), or that today over 3,000 Venezuelans have returned to Venezuela through “Plan Patria” after discovering that life in Colombia, Peru or Brazil wasn’t what they were promised. For her final segment, Tremonti interviews Rebecca Sarfatti, who sits on the board of the Canada Venezuela Democracy Forum, a non-profit organization in Canada. Not once has she interviewed a Venezuelan living in Venezuela, but somehow Sarfatti gets centre-stage. As the saying goes, you are the company you keep, and Sarfatti is a leader in the right-wing Venezuelan community in Canada, a community that publicly attempts to silence the voices through threats and intimidation. Most recently, the President of the Canada Venezuela Democracy Forum, Soraya Benitez, called on her right-wing mobs to give a “warm welcome” to the Vice-minister for North America of the Ministry of Foreign Relations of Venezuela when he visits Canada. What kind of respected journalist would show such a disregard for even the appearance of impartiality? How about playing the words of Alfred de Zayas? “A disquieting media campaign seeks to force observers into a preconceived view that there is a ‘humanitarian crisis’ in the Bolivarian Republic of Venezuela. An independent expert must be wary of hyperbole, bearing in mind that ‘humanitarian crisis’ is a terminus technicus that can be misused as a pretext for military intervention…” Or would that hit too close to home? You’re much more comfortable with the words of U.S. President Trump at the United Nations General Assembly, right? “More than two million people have fled the anguish inflicted by the socialist Maduro regime and its Cuban sponsors,” might just be right up your alley. As poor, working and oppressed people in Canada, we cannot rely on the CBC, or any mainstream, capitalist news outlet to tell the truth about Venezuela today. It is not only The Current, but many programs on CBC that continued to propagate the same lies about Venezuela. As the mouthpiece of the government of Canada, they will never put forward the voices of poor, working and oppressed people in Venezuela who support the revolutionary government of President Nicolas Maduro and are carrying forward the Bolivarian revolutionary process. It is our responsibility as people living in the United States and Canada to elevate their voices, and join with them in organizing to bring an end to the U.S.-led intervention, sanctions and threats against the sovereign country of Venezuela. This article was also published on Fire This Time.